Are you a traveler or journalist looking to share your journey with the world? Today, we’re happy to introduce our new WordPress theme that helps you do just that. It’s called Wanderlust, and in this post, I’d like to give you a little tour of everything it has to offer. With the rise of the digital economy, there’s been an accompanying rise in digital travelers and location independent workers. I know this because I’m one of them! And as people like you and I spread around the world, we want to share our travel experiences with everyone else (or at least our friends and family, right?). That simple little idea is the impetus behind Wanderlust. From the ground up, Wanderlust is built to support those who love exploring the world and sharing their experiences with others. 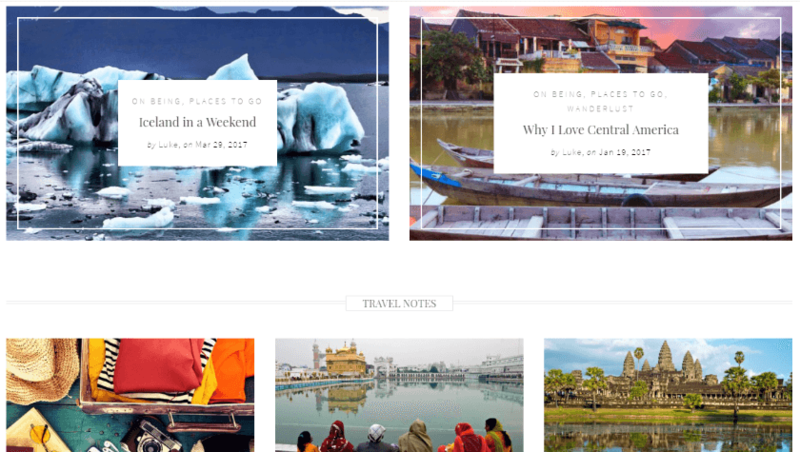 It’s the perfect theme for travel bloggers, travel sites, or wandering journalists. If you’d like to learn why that is, keep reading and I’ll show you some of the nifty ways in which Wanderlust can help you share your travel experiences with the rest of the world. 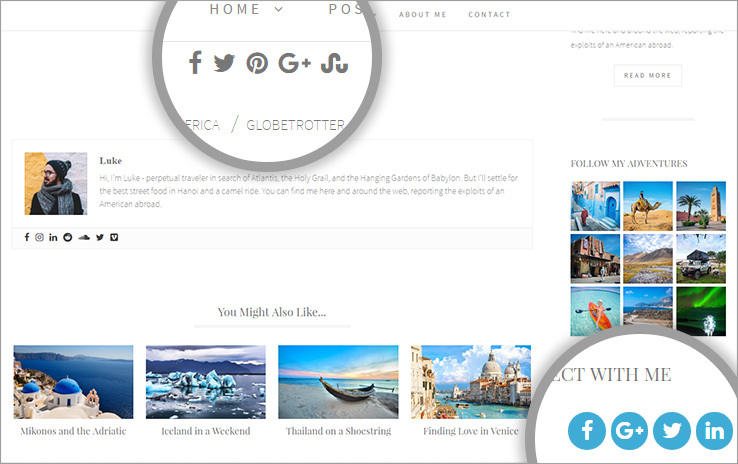 Why Is Wanderlust Perfect for Travel Sites? A huge emphasis on visuals. And it makes perfect sense! You’re visiting all of these interesting and beautiful places, so your visitors naturally want to see everything up close and personal. That makes your visual content the lifeblood of your site. So how does Wanderlust help you showcase all of your cool pictures and videos? Let’s start at the beginning – your homepage. 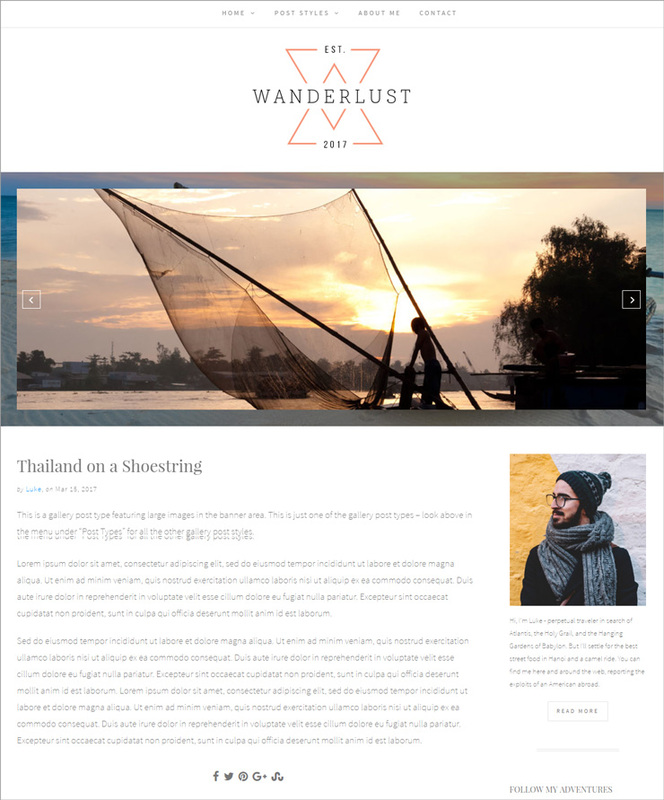 Wanderlust features 3 different homepage styles, with each one putting your striking visuals front and center. And it’s not just the homepage which is focused on showcasing the amazing shots you’ve captured on your travels. 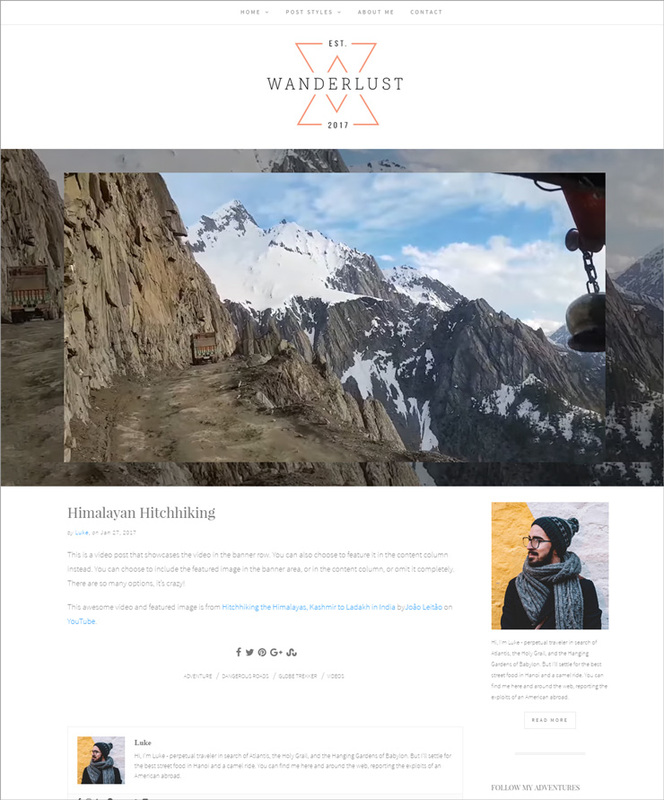 Wanderlust’s post styles also make it easy to display your content. 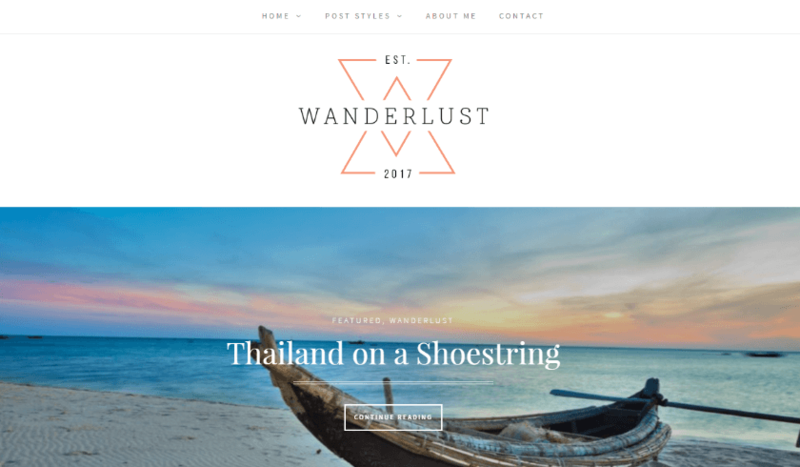 In total, Wanderlust ships with 9 different custom post styles that allow you to showcase everything from text, to video, to image galleries. Your travel blog is an extension of your personality. That’s why we don’t force you to use our style. Wanderlust is easy to customize and make your own. Change colors, homepage layouts, etc. You’re never locked into how the demo looks! 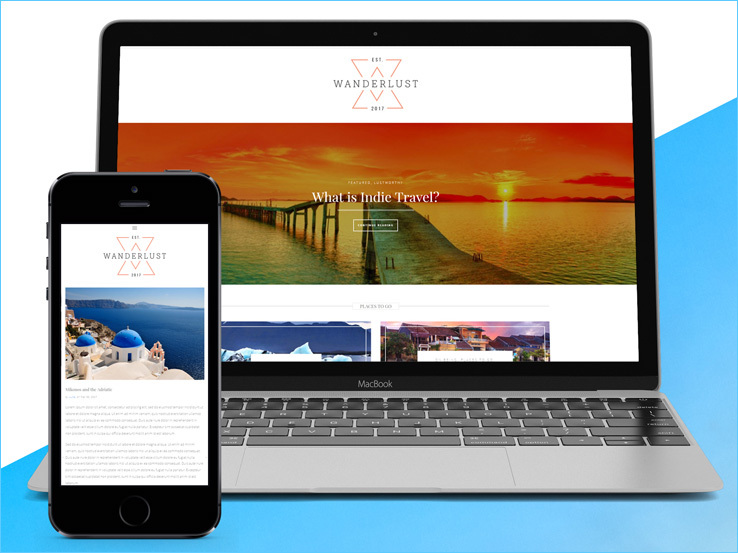 Wanderlust makes the whole customization process easy, too. Want to change the color of a specific element? Just use the color picker tool! Want to add a new widget? Just drag over one of Wanderlust’s custom widgets. 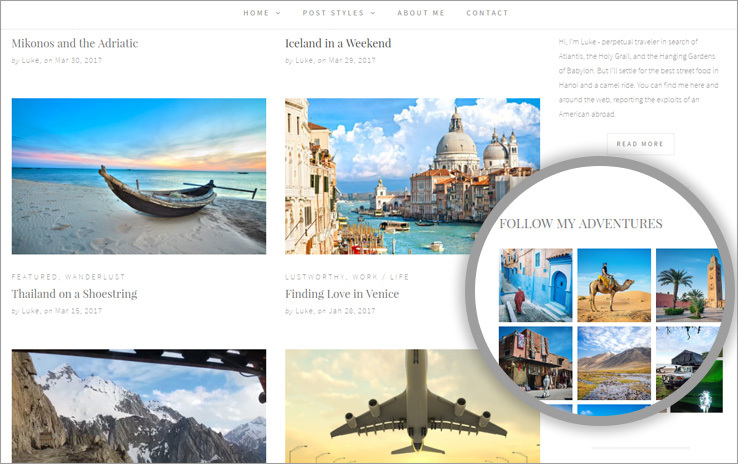 We’re guessing that you created a travel blog because you like traveling, not because you enjoy playing around with bloated WordPress settings! That’s why we made Wanderlust easy enough for a busy, on-the-road traveler to use. You don’t need to be a code guru, nor do you need to make managing your travel site your full-time job. We also built in support for popular plugins like Contact Form 7 so that you can easily set up important pages like your contact page. Social media is where you connect with readers and other travelers, so it’s naturally an integral part of many travel blogs. We know this, which is why we baked social media into Wanderlust in two important ways. Not using Instagram? No problem! You don’t have to use the Instagram feed. But it’s there if you need it! Beyond showcasing your Instagram feed, Wanderlust also makes it easy to highlight all of your various social network profiles. Just pick and choose your social networks and link them up via stylish icons. Optimized code is one of those things that, done right, you never even notice. Your site just hums along without any issues. It’s great! But if you have a poorly coded theme, your site will load slowly, bug out sometimes, and just generally be a pain to use. Don’t worry! We’ve made sure that Wanderlust falls into that first category. 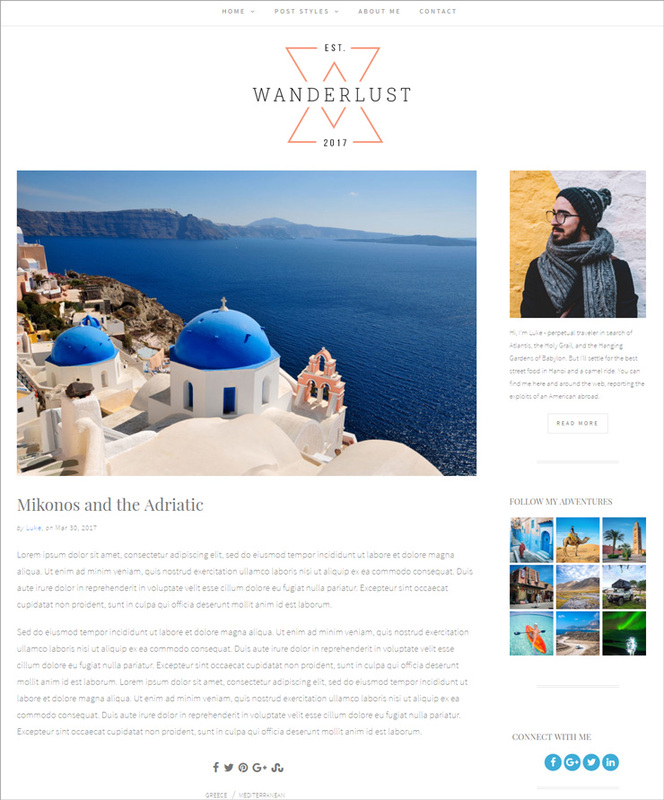 First, we built Wanderlust on the well-vetted Bootstrap Framework. Then, we followed that up with an emphasis on clean, unbloated code. And finally, we topped it all off with SEO-optimized layouts and easy integration with your favorite SEO plugin. Ready to start sharing your awesome travel experiences with the world? At just $39, Wanderlust is affordable for even the most budget of backpackers. If you’d like to get started, you can purchase Wanderlust here. Or, if you’d rather see it live and in person, you can view the demo here.